From stunning natural pools to adventures through mangrove forests, there's more to Krabi than meets the eye. There's a whole host of adventures just waiting to be taken Krabi Province is said to house some of the finest beaches in the world. 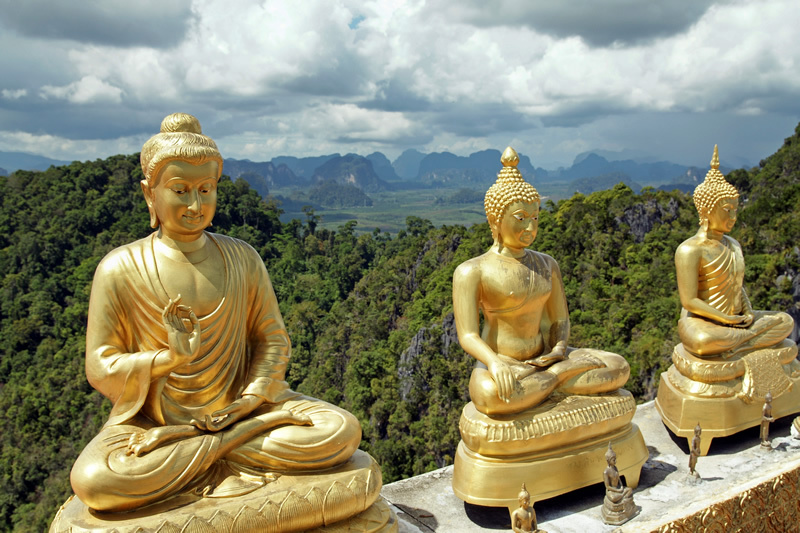 Here are some of the top 10 best Krabi daytrip you can choose to embark on. Railay beach is potentially the most attractive beach in Thailand, accessible only by boat due to the large cliffs on each side cutting it off from the mainland. Here you will find stunning white sand, breath taking views and fantastic limestone cliffs. When you arrive at Railay, you will not find any roads or cars because of its cut off location, just a few long tail boats and a couple of bars to spend your evenings in. If you want to really feel away from the world this might just be as good as it gets. It is known as the home to many spectacular plants and animals. The Natural Park is an area of outstanding natural beauty, one part that is particularly inspiring is the Crystal Lagoon. Also known as the Emerald Pool, the water is naturally warm and completely clear, you can go for a swim and escape to another world whilst admiring the waterfall. 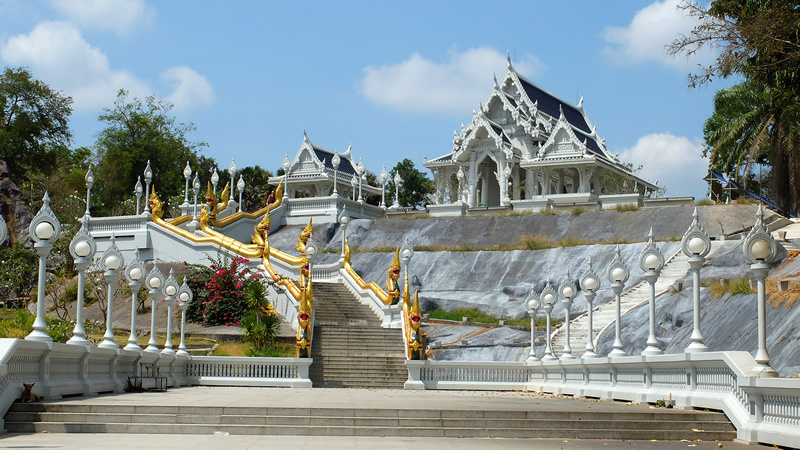 One of Thailand's natural wonders and certainly worth a visit is this warren of caves that sit within the jungle and house many monks that live and worship here, legend has it that a tiger once lived in the cave which is where the name of the temple originated from. The caves can be explored and you will find many icons and relics to take a look at. There are two islands, Phi Phi Don and Phi Phi Leh, Phi Phi Don is inhabited and is the one where all the tourists flock. 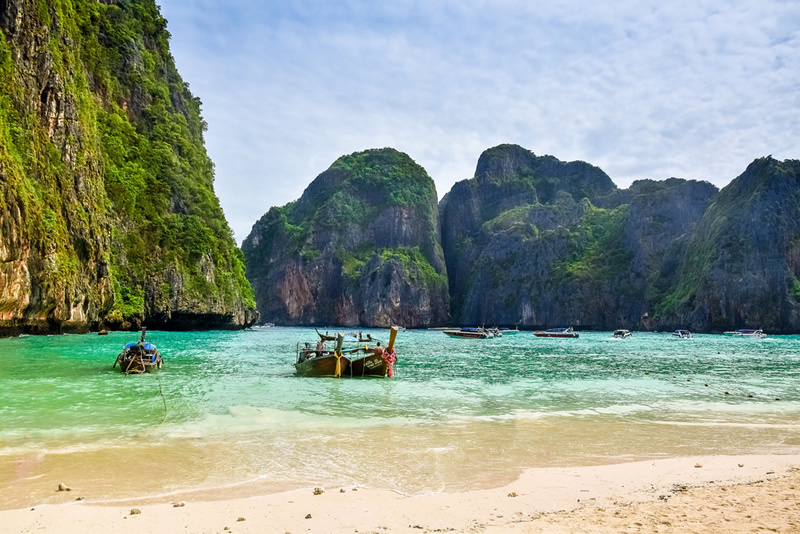 After being used as the film location for the movie 'The Beach' The Phi Phi islands shot to fame and the tourists have never stopped coming, you can get there by speedboat which takes about forty five minutes from Krabi mainland. 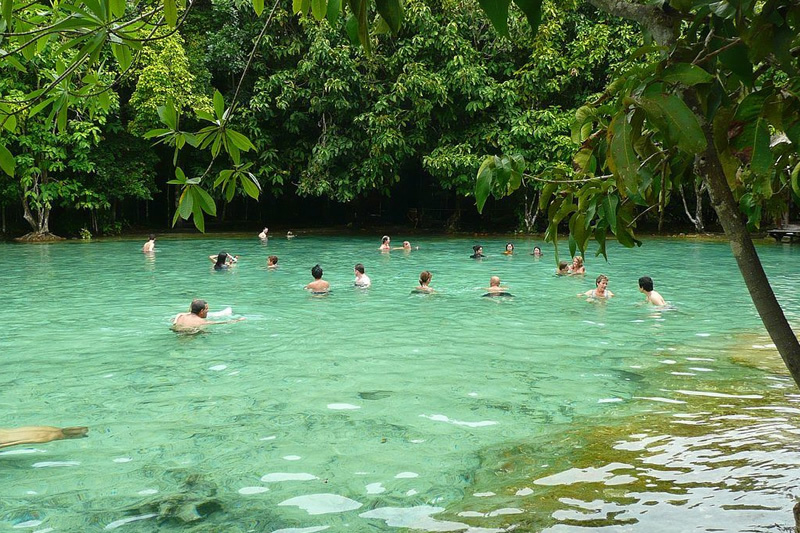 Set inside beautiful rainforest surroundings are the Krabi Hot Springs. 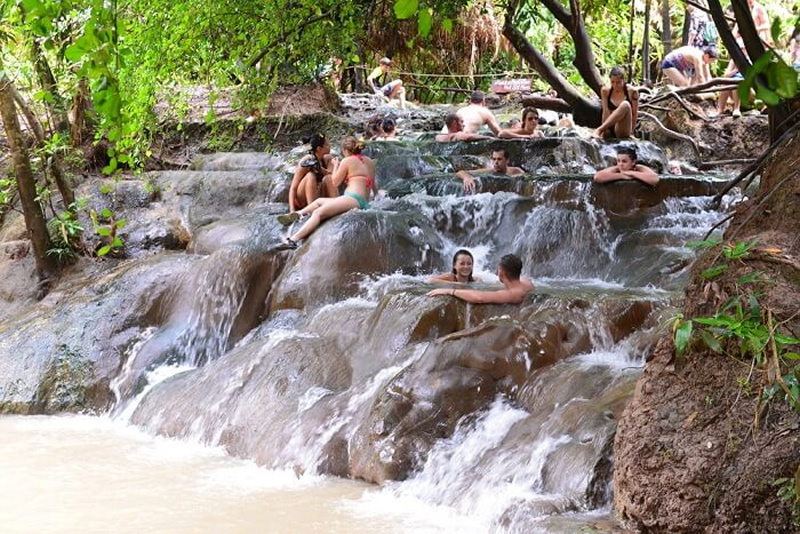 They have been cut into the smooth rocks and the water is provided from deep rooted thermal springs that are located inside volcanic chambers. The water get up to temperatures of forty degrees Celsius and contains natural mineral salts that have many healing properties. Most tourists travel here to get the water. 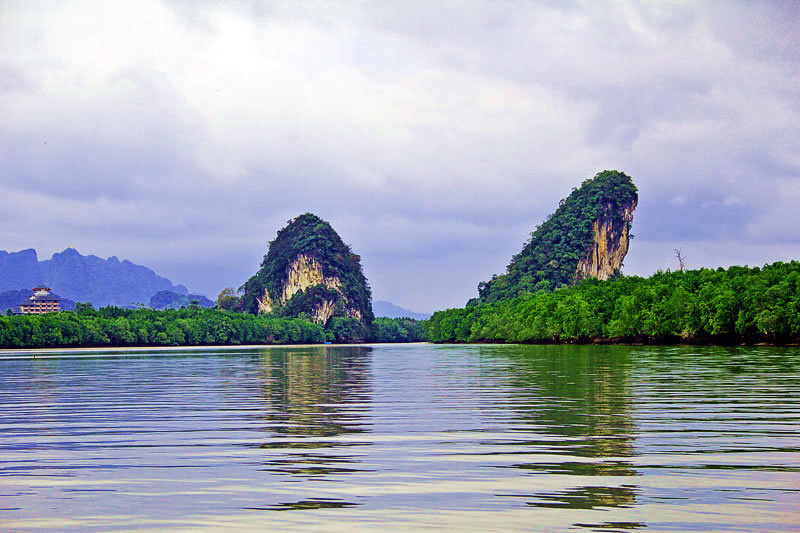 The Khao Khanab Nam Mountains are the most famous landmarks in Krabi, they sit either side of the river and are depicts real natural wonder. The two mountains sit on top of a large series of caves that have many stalagmites and Stalactites, there are also a large number of human skeletons there that could have been from people stranded during a flood. 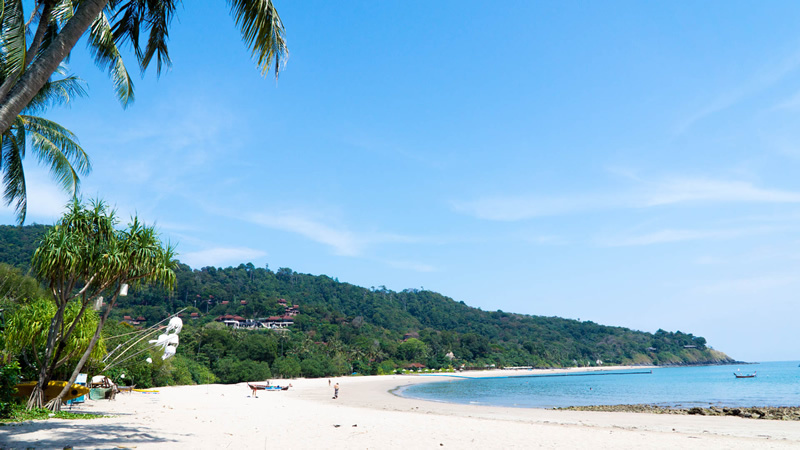 Koh Lanta Yai is an island about two hours away from Krabi Town, it is a small island that stretches about twenty kilometers from end to end. The island is inhabited and home too many guest houses and resorts. The island itself has various beautiful beaches that are often quiet but look absolutely stunning. If you want to relax for a few days this is the place to get away and do it. Unlike many places that you visit during holidays, Krabi Town is different, it still receives many tourists but it has not changed itself to help the tourists needs. It has still managed to retain its 'local' feel. The river running though the town is always full of fishing boats bringing in their days catches ready for the restaurant tables. The town has a genuine feel to it with its local bars and eating spots to it is worth visiting for that authentic taste of Thailand. Dating back to sometime between 25 and 40 million years and sitting on a 200 meters long stretch is a fossilized shell fish cemetery, Limestone deposits in the surrounding water covered the shell fish and fossilized them, it is one of only three cemetery's like this discovered in the world today. If you like geology then this has to be visited whilst you are in Krabi. 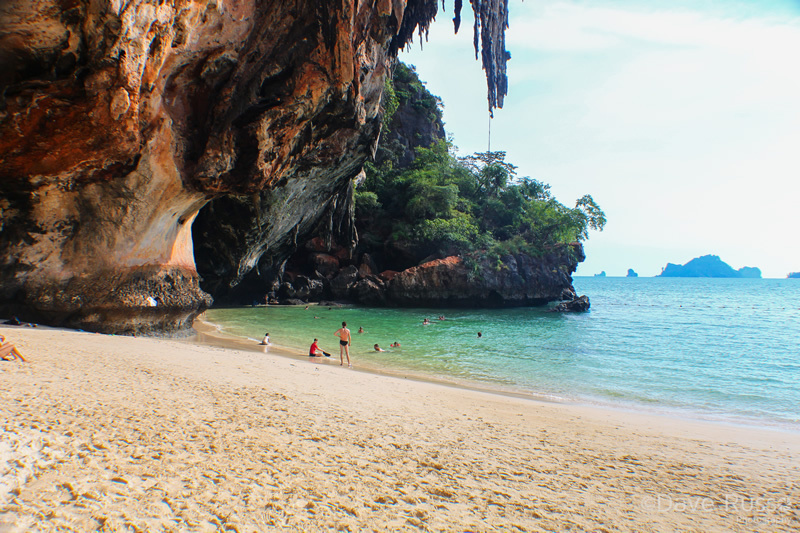 One of the most popular tours that visitors to Krabi go on is the Four Island Tour, It takes you on a tour of four different islands, and they are usually Tup Island, Phra Nang Cave, Chicken Island and Poda Island. The tour is on a long boat and will stop at each location giving you time to swim, sunbathe, explore and stop for fun.